It has been over six months and 200 days since Bruno underwent surgery to clean out an infection in his left, front hoof. Surgery included taking out a significant portion of his coffin bone as well. We were told it would be a year before Bruno would be ready to ‘try’ to work again. We had gotten the horse from our trainer, Dev, who unapologetically said he was playing to my rescue horses mentality. From the moment I saw him on Dev’s trailer, standing with his ears up and nose to the wind, I was smitten with him. He was released by the great docs at Texas A&M Vet Hospital with clean x-rays in June. We were ready to start the Bruno goes to work story as a preamble to the Bruno jumps at horse shows story. But it has not gone as we hoped. I have been decidedly quiet on the Bruno front. 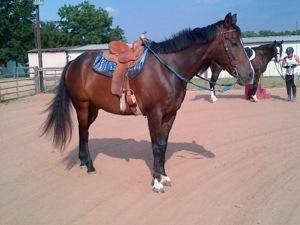 Since his June release we have had three good rides without lameness. Not what we had hoped. We have added bute and injections for any inflammation he may have. But nothing has really a helped. 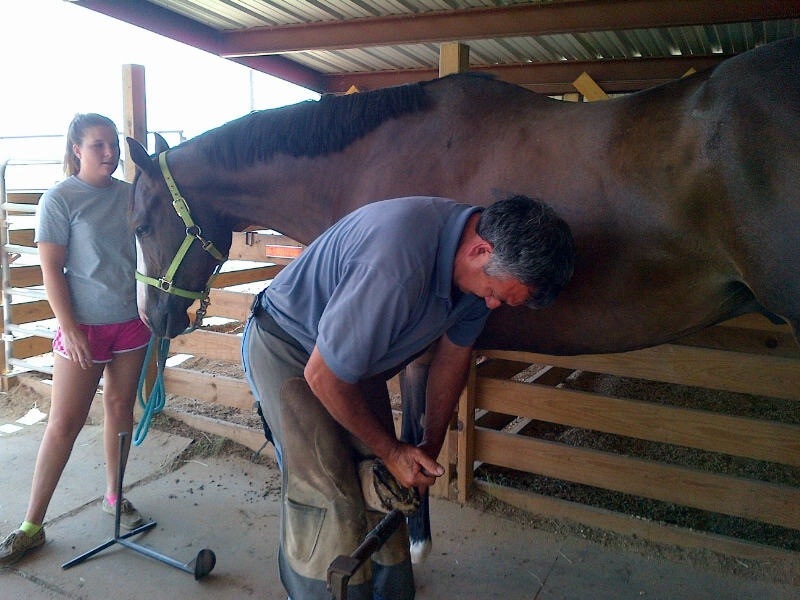 Our farrier, Roland, getting ready to do Bruno’s feet for the first time. We have been told when we have posted pictures of Bruno, that his toes were too long. I thought so too. But it is really hard to accept the farrier chosen by TAMU would not have done them well. Roland has done my horses for years. I trust his judgement. So, today I told him evaluate this horse and treat him as any new client. First, he wanted to get some toe off (the toe is the point facing the off the front of the hoof). And then I just trusted him. We definitely needed a change for the better. The right toe has not been trimmed yet. Look at the rounder, shorter left foot. Then we added a support pad in the straight bar shoe to hopefully give Bruno more help in maintaining the new hoof. Roland cut back all four feet. I prayed it would be enough to bring this horse back to soundness. We releAsed him to the pasture and watched as he pounded down the line,then through and around the big arena. He was looking pretty solid. Mickey has been working and wearing shoes at least 12 years. But he is not working much now, so we thought we would try to leave him barefoot. It has been very dry so maybe not the best time but we will see how it goes. Bruno’s ride was the best we have had since the surgery. It was not perfect, but he was moving much better. I really hope we have the right shoes on him now to move forward. His trots and canters were good tonight. Liking this shot at the trot through the dusty arena but with nice position and extension. 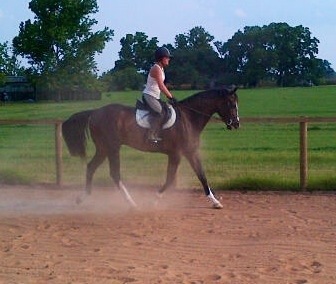 Mickey and I had a good ride with his new barefeet as well! I hope we are on the cusp of getting the big horse finally into training. 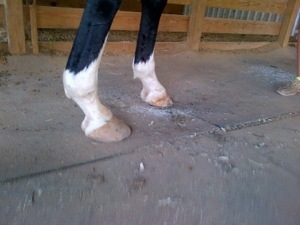 This entry was posted in A Bruno Story and tagged hoof rehab, lameness in racehorses, OTTB, TAMU Vet Hospital by Exechorseluver. Bookmark the permalink. You are so right! It is intimidating to change direction from what the esteemed Texas Vet school has directed, but you’ve got to go with the right thing. And your right about this long dance we have started. I must be patient. Thank you!